Have you been missing my stories about Slavic folklore characters? We have already talked about Baba Yaga, so now is the turn of another very important character, Koschei the Immortal (Koschei the Deathless), or Кащей (sometimes written as Кощей) Бессмертный. So how does the prince kill Koschei and save the beautiful girl? That's a tough task. First, he needs to find Koschei who usually lives far away. So he starts his journey and after a long time he meets a wise man or a woman who tells him the way and sometimes gives the prince a magic ball of wool that leads him to Baba Yaga. She tries to kill him but doesn't succeed, so she tells him how to defeat Koschei. Oh, did I tell you he's immortal? He can't be killed by any weapon, can't be poisoned etc. In order to kill him, the prince needs to find Koschei's death. He needs to go to the end of the world (or Buyan Island, that depends on the fairytale) and find the biggest oak tree. Koschei's death is in the needle which is inside the egg. The egg is inside the duck, and the duck is inside the hare. The hare is in a huge chest either buried under that oak tree, or chained to the tree. While looking for Buyan Island and for the oak tree the prince meets 4 animals and even though he is very hungry he doesn't kill them, and the animals later help him to get Koschei's death. In the end, the prince breaks the egg and then the needle, and voila - Koschei is dead, his castle is destroyed and the beautiful princess is saved! According to the fairytale "The frog princess/Царевна-лягушка" (in the Russian fairytale it's the princess who is turned into a frog, not a prince), Koschei has a daughter. Her name is Vasilisa Premudraya (Vasilisa the Wise). 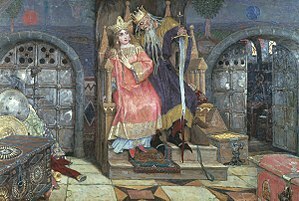 Koschei turned her into a frog because she was smarter than he and she was supposed to stay a frog for three years, but she met a young prince Ivan (Иван-Царевич) who changed her destiny. That's all about Koschei. One last thing I wanted to say is that with time people stopped seeing this character as a demon. In children's films and cartoons he is sometimes portrayed as a wise and even somewhat humorous and thus charming character. And sometimes parents who have thin kids call them "Koschei" just because they are skinny (I was an extremely skinny kid, so I was called Koschei all the time :)), so this name has obviously lost some of its negative connotation though people do remember all his evil deads. I see. :) I started with films, and ended up reading and rereading all 7 books. I really love them. It's not only an interesting fairy tale, but, in my view, it has very deep religious and philosophical basis. The author seems to be a true Christian and a very intelligent person. Besides, English in the books is fabulous. Perhaps you'll read it some day, maybe with your daughter. I read the first book for my older son, he loved it. Wow, is that really that obvious from those books that their author is a deeply religious person? I've watched a couple films but for me they seemed mere fairytales for children. Your observations are definitely interesting. In fact, they are more intriguing than Harry Potter movies I've seen. Well, from the films it's impossible to even understand what it is all about. The 6th movie is impossible to understand at all, if you haven't read the book first. In the books there are lots of dwelling thinking about life and death, especially about death, about the fear of death, but also about love, friendship, and I had an impression that the author could be religious to be able to write something like that. The most of the philosophy is in the last two books, while the first and the second are real fairy tales. But I certainly recommend to read the book in the original version, the translation, at least the Russian one, is not very good.